The other night while watching some MMA (something I rarely do) I noticed that the arsenal of some of these fighters contained low kicks to the thigh, a la Muay Thai. They don't look like much, but speaking from experience they're pretty brutal. I remember a seminar where the instructor showed some conditioning moves designed to prepare the legs/quadriceps in the event of a nasty low-kicking assault, similar to kotekitai (forearm toughening routine) that karate people employ. With the exception of Kyokushin practitioners, most karateka aren't accustomed to taking leg strikes (or head shots for that matter), so some desensitizing routines for the lower extremities isn't a bad idea. 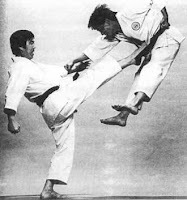 In most traditional Okinawan karate tourneys, low kicks are prohibited, yet high-target kicks are okay if delivered with control (i.e. without knocking out your opponent). You don't need a degree in kinesiology to figure out that a low-kick has a far higher success rate of being delivered with "control" than a haymaker crescent kick aimed upstairs. I've already posted my thoughts on low kicks and shooting high, so I'll move on. When front and roundhouse kicks are taught the toes are curled up. This allows the ball of the foot to take the impact of the target. This is done for practical purposes and safety, but the curling of the toes becomes a moot point if you're on the street and wearing shoes. Many practitioners will round kick with the instep (wearing foot guards) to accentuate reach. Good, flexible kickers that rely on their natural gifts tend to break some toes through the years, probably more from wear and tear than poor kicking form. Chojun Miyagi, the famous founder of Goju-ryu, would puncture holes in kerosene cans at demonstrations utilizing a specialty of his: the toe-kick. Imagine the conditioning and training it took to do that. The last one you won't find in the kata of traditional karate, but most schools will show it to some degree. Although far from a stellar kicker, I can actually perform spin-kicks fairly decent, I believe, courtesy of a mild case of scoliosis (curvature of the spine) that actually allows me to rotate my body in an unconventional albeit advantageous manner conducive to this manner of kicking. Lucky me. Interesting post. In tae kwon do we were taught both versions: ball of foot and flat of foot. In praying mantis it's all flat of foot and generally waist or lower. The only ones I'll try high are these: crescent, round, & front snap. I can pull the spin hook off but I need to be warmed up with about three practice kicks--not realistic in a fight! As for leg conditioning, we did a lot more of it in TKD (from all the sparring you just get used to having your legs all banged up). We do zero in praying mantis. However, we do an awful lot of Kyokushin-style arm conditioning. My sifu actually takes a hammer to his forearms. I kid you not. He lets it drop with gravity. I think that's nuts! I told him that's a good way to keep sales people from bothering you. Sit on your porch cracking your arms with a hammer! Agreed, big time. As far as high target kicks go, I like the spin hook and crescent. I've noticed that some if not most Chinese stylists wear shoes of some sort when they train. Maybe this explains the flat-of-foot method to kicking. Seems like a more realistic training approach. keep writing, Sensei, I'll keep reading. Speaking of kicks, I just discovered how to use them to make one fall. recently, it has become a habit of mine. :) very useful! The shin-strikes are effective, but the exact form of those things I find to be a bit elusive. I could never figure out if one is supposed to strike with the shin (bone) or the adjoining muscle (tibialis anterior). I guess the shin could become denser and calcified in time, but striking with the muscular part of the shin (or maybe a combination of both?) seems better. Or at least safer. For the latter, it would require more of a rotation of the striking leg (toes angled down) that could compromise the effectiveness of the kick. There's a good article at 24FC about training with shoes that you might like. It brings to light some of my points in greater detail. Thanks for stopping by. During my Shotokan years we used a lot of mae geri and mawashi geri. With Muay Thai I learned real fast how effective the thigh kick can be. First, ouch. Then, alright. I even posted recently about it. Thanks again for the great post. "Are you familiar with the theory behind knockdown power in thrust or push kicks?" Well, unfortunately until now, I was not. Strangely, we were doing the thrust version of kicks until... 2 years ago, we changed to snap kick because there were some knee injuries. I've seen snap kicks in actions in my short time. They are more like jabs than what feels like a kick effect. I wish I have more time in the near-future to test these things more. :-) Right now, training is done when babies stop crying. 10pm+. ugh. Totally agree. My own views on kicks seem so polarized. For practical purposes like self defense, I like some basic low kicks as well. But since I'm also a fan of open forms, I love watching high fancy kicks too, but recognize that their purpose in my book is for forms, and open forms for that matter. So I love both as different types of kicks have a place in different aspects of martial arts. I have found body type to be a great determining factor in peoples' choice of what tools they keep in their kicking toolbox. But, practicallity has to be considered as well. The high flashy kicks in movies can get you hurt badly in a fight. The tendency toward the lower, better balanced kicks in Okinawan styles I think comes from simple pragmatism over asthetics. They were designed solely for fighting. hope you are doing allright. Happy holidays and enjoy what life gives you. First time I have ever heard someone say that they were lucky for having scolliosis. Depending on flexibility, high kicks shouldn't be any harder to control than low. But, I could see not being able to control the gravity assisted kicks, such as the axe kick and crecent kick, with nearly as much control. If you are at the edge of your flexibility you are going to find control hard though. It might be that coming from TKD, I am used to throwing a majority of my kicks over the waist and about a quarter of those at the head. Depending on flexibility, high kicks shouldn't be any harder to control than low. What I was referring to was balance. The higher you kick, the more of a liability balance becomes; ergo less control in its execution. This is true regardless of the skill of the practitioner.